Free parking in Cape Town – really? I wish someone would park on this spot, and when the owners attempt to fine them point out that the sign really does say that "illegally parked cars will be fine". If you've seen the sign and done this - please report back your experience as a comment below! The number of professionally printed signs hosting incorrectly spelled words, or ambiguous writing, is simply astounding. My spelling isn't very good - but this is why I use a spell checker. 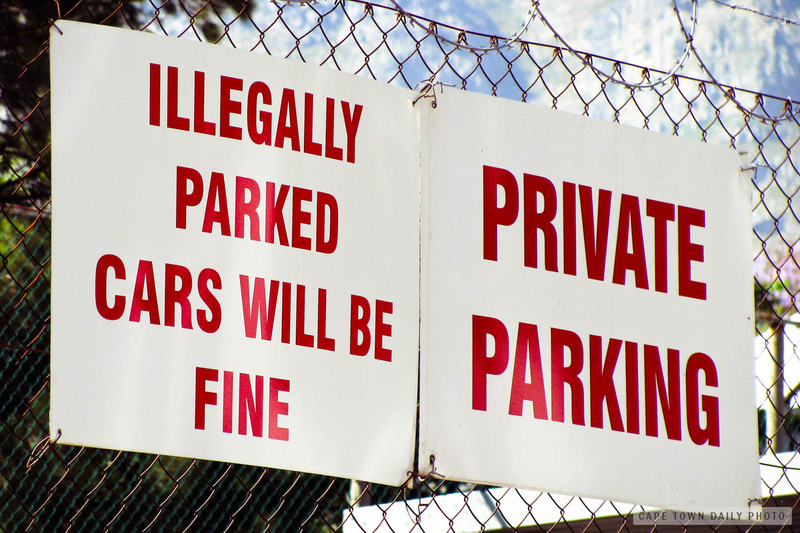 So the question is; is there an excuse for sign-writers? Signs are short and professional sign-writers should surely notice incorrectly spelled words or sentences that clearly don't mean what was intended. Posted in General and tagged sign on Saturday, 16 October, 2010 by Paul. Lol, gota love how many signs have great spelling and grammar these days! We have an advertising agency that does some of our work who seem to ignore the mistakes and do the work with them in it. Amazing how inept some people are. I love this sign – I photographed it on my first trip over three years ago and look out every time since to see if anyone has put the d back in – but no, it is reassuringly there every time! Pamela – whohoo! Glad you spotted it!